Having started the year at USD 55 per barrel, the price of crude oil rose to USD 67 later in 2015 due to the drop in number of wells, geopolitical factors and a higher-than-anticipated rise in demand. However, developments in the second half of the year, including the expected rise in supply due to the nuclear deal with Iran, increased economic risks in emerging countries, OPEC's decision to increase the above-quota production volume and the lifting of the US crude oil export ban, caused the price of oil to close the year down by 41%, at USD 36 per barrel. Despite the increased need for funding, losses stemming from the exchange rate, and losses on inventory caused by falling oil prices, the low price environment also had a positive effect, especially by bolstering individual consumption, and thereby boosting the Mediterranean refinery margin and raising the profitability of the refining sector in 2015. Turkey's Energy Market Regulatory Authority (EMRA) decided to implement a two-month price ceiling in the distribution sector starting from 20 February 2015, thus intervening in profit margins and profit margin distribution rates. The drop in product prices had a negative impact on companies that had not taken hedging precautions, while the volatility in exchange rates had an adverse effect on companies with open foreign exchange positions. 2015 was a year in which a large portion at the dealer contracts were due to be renegotiated within the framework of the law enacted in 2010 regarding the issue of signing contracts for a 5-year period. In Turkey, the overall LPG sector grew 8% over the prior year with the drop in LPG prices leading to a rise in domestic demand for LPG. The autogas market posted 9% growth, while the Turkish cylinder gas market expanded again after a 15 year lull, at a rate of 2%. Boasting the largest autogas market in Europe, Turkey accounts for 11% of the world's total autogas market. Some 4.2 million vehicles, 41% of the total number of automobiles in the country, run on autogas. This vehicle number corresponds to 17% of the global LPG car fleet, which totals more than 25 million. In 2015, the LPG end-consumer price (pump price) was 15% below its 2014 level, which had a positive effect on autogas demand. The Turkish autogas market sets a model for other countries with its sustainable growth trajectory. Turkey's installed generation capacity rose to 73,150 MW as of year-end 2015 and is divided between three sub-sectors. State-owned power plants account for 29% of the total, while power plants based on the Build-Operate and Build-Operate-Transfer model and selling electricity to the state-owned Electricity Wholesale Company (TETAŞ) have a 12% share. Private sector companies that operate in the free market account for the largest share, the remaining 59%. A breakdown of the installed capacity by fuel type shows that hydroelectric power plants have a 35% share. Natural gas power plants account for 34%, and imported or domestic coal-fired power plants make up 21%. The remaining 10% share comes from other renewables and thermal power plants. The electricity market is managed by the Energy Markets Operation Company (EPİAŞ), which operates according to secondary legislation issued by EMRA based on Electricity Market Law No. 6446. Meanwhile, the market's physical administration is carried out by the Turkish Electricity Transmission Company. Over the last decade (2006-2015), Tüpraş's total investment spending amounted to USD 5.5 billion. 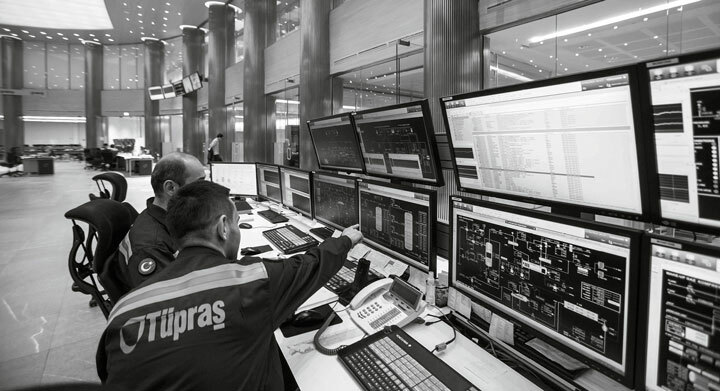 In the oil sector, where competition grows fiercer by the day, Tüpraş boosts its productivity in line with market demand in order to continue creating maximum value for Turkey and shareholders. The Company aims to take operational excellence to the highest level while reaching the top ranks in terms of enterprise availability and energy index among regional refineries. To this end, the largest one-off private sector industrial investment in Turkish history, the USD 3 billion Residuum Upgrade Project, was completed. As such, a large volume of imported products, especially diesel, were replaced with domestic production, which is expected to narrow the national current account gap by USD 1 billion annually. During the year, Opet bolstered its second place position and maintained its market share in the fuel distribution sector, which grew by 11% in 2015. Opet aims to be the first choice of consumers in the sector through its "Supreme Service Philosophy." Efforts to this end yielded significant achievements crowned with awards in 2015. Aygaz maintains its competitive edge with its efficient dealership network throughout Turkey, strong corporate business culture, close proximity to the end consumer along with an excellent service quality and speed. 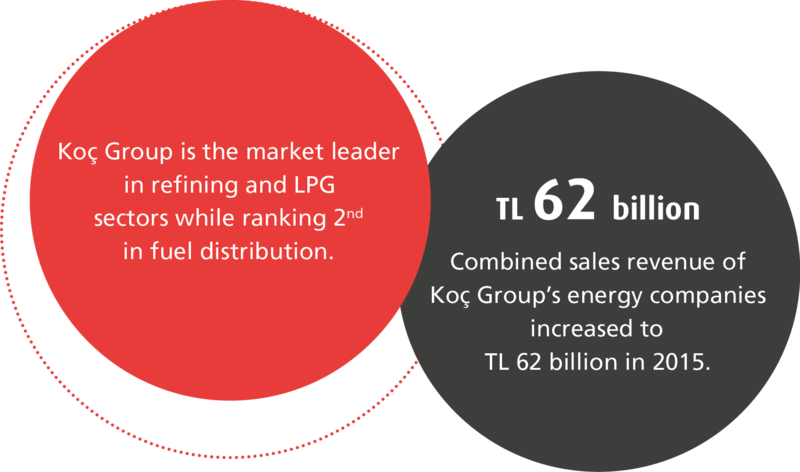 In 2015, Aygaz captured a 29% market share in the total LPG market, thus remaining the market leader. In 2015, Demir Export commissioned Turkey's first fully mechanized underground coal mine in Manisa Soma. Boasting total installed capacity of 364 MW, Entek posted consolidated sales revenue of TL 322 million in 2015.